Hydropower projects that lack due diligence can have devastating results. 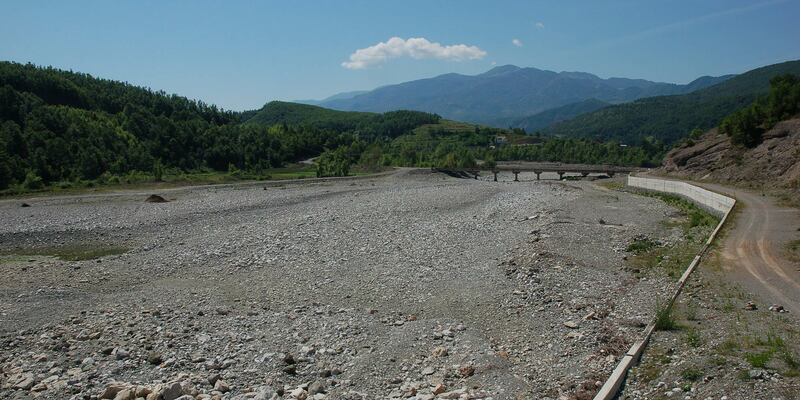 Here, the Rapuni dam in Albania leaves no water for the river downstream. As discussed earlier on this blog, the Green Climate Fund is struggling with its goal to support intermediate and small institution. Small entities have difficulties in fulfilling GCF requirements and are often not even able to develop a proposal for their project. International financial institutions (IFIs) on the other hand, seem to benefit from this ‘market entry barrier’ as they are getting the biggest share of what the fund offers. They certainly then redistribute the grant for smaller subprojects but the transparency and participation of final beneficiaries is all the more difficult this way. In summer 2017, both the European Investment Bank (EIB) and the European Bank for Reconstruction and Development (EBRD) signed an Accreditation Master Agreement with GCF to be able to receive and redistribute funds. During the last GCF board meeting, the EBRD proposed the biggest of the 11 approved projects to the table. With GCF funding worth USD 106 million, the EBRD aims to develop the renewable energy sector in the fossil fuel dependent Kazakhstan by investing a total of USD 550 million in 8-11 intermediate and small subprojects in the renewables sector for the next five years. Subprojects can include construction, grid connection, commissioning and launch of renewables such as solar, wind, small hydropower and biogas. Kazakhstan’s renewables potential lies mainly in hydropower. Already ten per cent of the country’s energy production comes from hydropower plants. Environmental groups have raised concerns about the potential risks of hydropower plants that can often cause serious negative environmental impacts. The EBRD states that it will not support hydropower plants bigger than a 35 MW, which is the maximum size of a small hydropower plant according Kazakh law but much larger than the 10MW upper limit defined by both the International Renewable Energy Agency and the International Energy Agency. Small, however, does not guarantee a low environmental impact. Private banks might be used to keep information confidential to protect their clients. But EBRD loans are public money and banking secrecy rules have to be modified in order to acknowledge the fact that the public has a right to monitor these financial flows. The Green Climate Fund does make some effort in supporting “small receivers” and their projects. Five more direct access entities (DAE) were accredited recently, allowing them to send proposals to be considered by the GCF board. At its recent meeting, the board discussed the possibility to prioritise the accreditation of entities with direct access and it agreed to enhance the support for DAEs in developing concept notes and funding proposals. Direct access entities should also benefit from a simplified approval process which enables using simple templates and demands less administration for proposals of up to USD 10 million with minimal or no risk. Yet, considering the support for intermediary institutions, the GCF is far away from becoming a fund for direct access entities as was the original idea. Instead of passing money through financial intermediaries, at each level reducing transparency and the ability to assess how the money is being spent, the Green Climate Fund should keep the responsibility in its own ranks and know and assess the specific subprojects before approving support. This is necessary until those banks that disburse the money start applying adequate transparency and public participation standards in financing hydropower projects. It is especially necessary in projects located in critical habitats and protected areas. Already before the last board meeting in October, the EBRD received 27 percent of all GCF finances. With the last large project the share will be even higher. Add to that other international financial institutions and what is left for direct beneficiaries is becoming less and less. 1. There has been a recent improvement regarding the transparency of the investments that are funnelled via the Western Balkans Sustainable Energy Financing Facility (WEBSEEF). The website now features a more detailed map of hydropower projects. However, WEBSEEF does not cover Albania where information about intermediated loans is still more limited.